While grilling up Thit Heo Nuong Xien (Vietnamese Grilled Pork Skewers) for my Memorial Day luncheon, I decided I could toss in a few pork chops into the marinade and re-do the photos for my Basic Vietnamese Marinade for Chicken and Pork. Well, I re-did the chicken pictures several years ago by making wings, my favorite meat for the recipe, but never did get around to making pork chops. 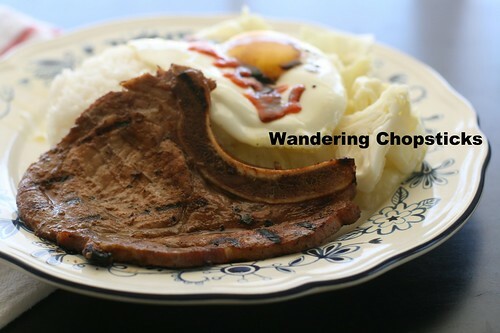 I ended up leaving the pork chops to marinate overnight, although you can get away with doing it for only about an hour or so. You can also cook them in the pan, like I've done many times before in the pictures with the basic marinade recipe. 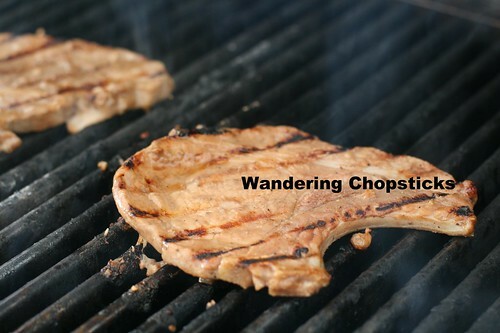 They grill up rather quickly if you choose pork chops that aren't too thick. 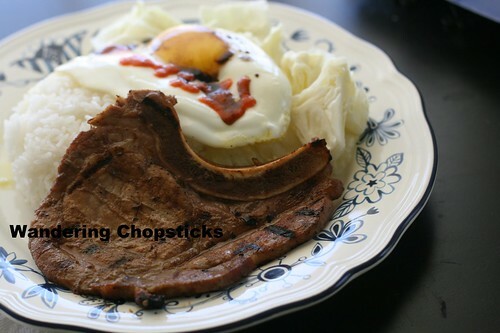 I served the pork chops simply with rice, steamed cabbage, and an egg doused in soy sauce and Sriracha chili sauce. Mince the shallots and garlic. In a shallow bowl, combine 2 tsps fish sauce, 2 tsps soy sauce, 2 tsps rice wine vinegar, 1/2 tsp salt, 1 tsp sugar, 1 tsp ground black pepper, minced shallots, and minced garlic. Slather the marinade on the pork chops and set aside in the fridge for about an hour. In about half an hour, flip the pork chops to make sure both sides are coated evenly. 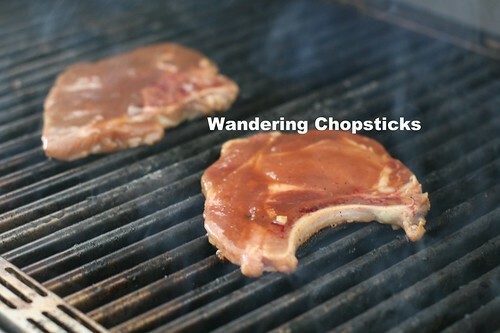 The pork chops can be left to marinate longer if you wish. Fire up your grill and cook the pork chops. Only a few minutes on each side is all you need if you chose thin-cut pork chops. Serve with rice and vegetables. 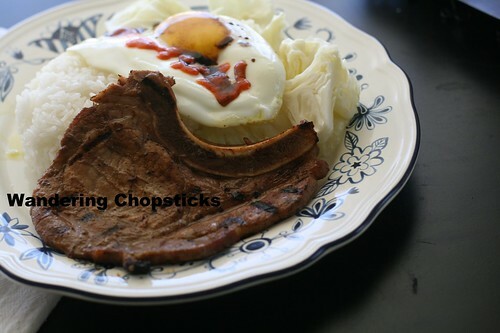 Or if you'd like to make a typical Vietnamese rice plate, you could serve the pork chops with Cha Trung (Vietnamese Steamed Meatloaf Egg Omelet). 3 years ago today, Rau Den Xao Chao (Vietnamese Amaranth/Chinese Red Spinach Sauteed in Fermented Bean Curd). 4 years ago today, my favorite bookstore, Powell's City of Books - Portland - Oregon. 5 years ago today, Canh Rau Cuu Ky (Vietnamese (Chinese) Boxthorn Soup). 6 years ago today, Goi Xoai Xanh (Vietnamese Green Mango Salad).